Adam posted this on my Facebook wall this morning. Gosh, he knows me. The reason he posted this was because I already live in this kind of world. I usually just moan and make grunting noises throughout the morning getting ready for work. My “good morning” to Adam is a hug where I rest my head in his chest and close my eyes, resting in his coziness. I always wake up after him and when I do, he simply laughs every single time because I wake up so disgruntled and disoriented. What can I say? Mornings and I don’t get along. I was talking with some co-workers today and we concluded that the older you get, the faster life feels. I think it’s because our lives are so much about routine. Think about it. Ever since we begin school at an early age, it becomes routine. Everyday, you go to school, you go home, you play, you have dinner, take a bath and go to bed. That was everyday. Maybe come middle school you have activities after school, and high school brought sports or part-time jobs. Since my memory is starting to fade, the first time I can remember life moving fast was in high school. I still remember graduation day mesmerized at how quick high school felt. College? A blink. Seriously. It came and went like the Kardashian marriage. And we get to now. Where life is moving faster than ever. Once you get out into the real world and into a full-time job it can become so monotonous that the weeks kinda of blur together. Working makes everyday feel the same. It’s a blessing to work. It’s a blessing to have a job. But sometimes we need to find the happy medium between “working to live” and “living to work.” This morning getting ready for work I kept thinking, “But I just did this yesterday!” That’s the monotony of life. It happens. I read once in a devotional through my YouVersion Bible App that so many people want to live in a state of perpetual excitement. The tedium of everyday living leads them to conclude that something is wrong with their lives. I think this is one of the reasons why our generation is so non-committal and always looking for a change of pace. Something new, something different, something faster, better. We try so hard to disregard our routines instead of finding the beauty IN them. Our best generation was that of my grandfather’s who is 91 years old. It’s the generation that stayed faithful to their spouse, found a job or two or three to raise their family, never complained about that first, second, or third job, and just did what they had to do. They were content. Something this generation knows nothing about. We’re the generation with the most “stuff” yet probably the most miserable. It’s sad. And I’m not discounting me in this. I am just as bad. My mind tends to dwell on the past and ponder the future. I never really think in the moment and just live my life. It’s something I’m trying to change. And want to change. I don’t want to miss out on my life. Because even in the monotony you can find beauty. Even in routine, you can find chaos. Even in a fast paced life, you can have moments. The little ones are the best. 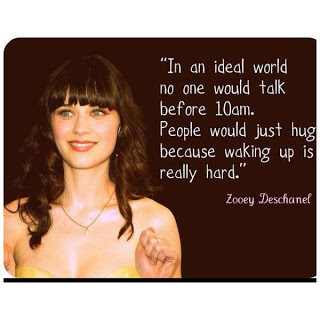 Like hugging Adam every morning. That’s a moment that makes waking up very worth it.